What Do Manchester City Do If Pep Guardiola Leaves After Completing the Quadruple? Manchester City narrowly edged past Brighton in the FA Cup semi-final last weekend, dismissing their opponents courtesy of an early Gabriel Jesus header. As the Brazilian stooped to nod home, the chances of an unprecedented four-trophy haul rose again. 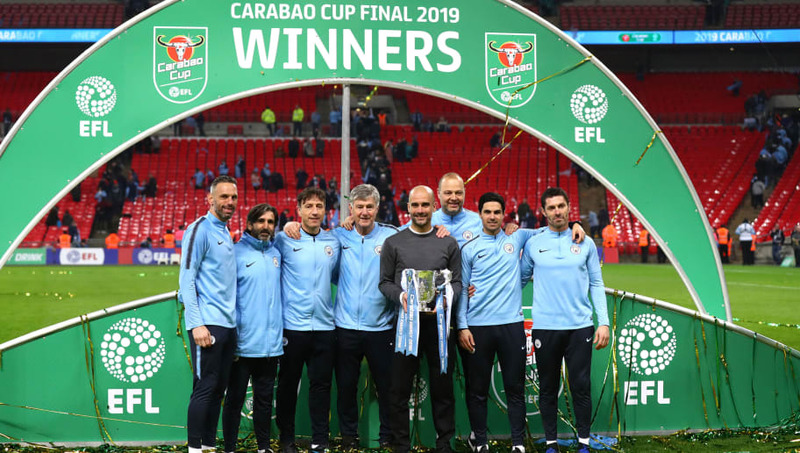 The Citizens secured the first piece of the puzzle with a nerve-shredding victory against ​Chelsea in the League Cup final at the end of February, the Blues taking ​City all the way to a penalty shoot-out. Whilst Kepa Arrizabalaga and Maurizio Sarri both lost their heads in the Wembley cauldron, Raheem Sterling kept his to leather the winning spot-kick in off the underside of the bar. The​ slender triumph over the Seagulls on Saturday ensured Pep Guardiola's men would compete in both domestic finals for the first time in their history, whilst a 10-2 decimation of ​Bundesliga strugglers ​Schalke saw City progress to the quarter-finals of the ​Champions League. There they will face fellow English outfit ​Tottenham, who they also play in the ​Premier League at the end of April. If City can see off Spurs in European competition and grab the points in the last of their hat-trick of upcoming meetings then the quadruple will be tantalisingly close. If they achieve such a remarkable feat, the club will have reached a veritable nirvana, the promised land, paradise. But where does a team go when they have climbed their Everest? If they reach the summit then they cannot climb any higher. Yes, they would qualify for next season's UEFA Super Cup and FIFA Club World Cup, but many do not view these as equivalent in terms of prestige to the four tournaments the Citizens are currently battling in. The legendary bodybuilder-turned-actor Arnold Schwarzenegger faced a similar issue prior to claiming the Mr Olympia accolade for a sixth consecutive year. His friend teased him in the build up to 1975 edition of the competition, stating: "The king of the hill can only go down, Arnold." He nonchalantly rolled over and replied: "Or he can stay up." Such is the mindset of a born winner, one who understands the transience of life and wishes to leave a long-lasting impact on the world. Guardiola's mentality is akin to that of the Austrian Oak, with an insatiable thirst for glory and unwavering expectation of perfection. His sublime collection of 14 honours in four campaigns with ​Barcelona demonstrates the Spaniard's desire for success and ability to motivate players who have reached the peak of their sport. Under his tutelage performance levels should be maintained and one would expect to see City once again competing on multiple fronts. He signed a contract extension at the Etihad Stadium less than one year ago, supposedly keeping him in Manchester until the end of the 2020/21 season. However, Guardiola is not one for staying in one place for too long, especially when he feels he has maximised the team's potential. He departed his beloved Barça following two Champions League triumphs, whilst ​Bayern Munich could not tempt him to remain for more than three seasons. Should City complete the quadruple, another swift exit could be on the cards. Few coaches are so adept at managing the varying personalities in their squad, nor at coercing the best out of their recruits. If he goes, there would almost certainly be a drop-off in performance levels. The City hierarchy may do well to learn from their neighbour's mistakes, ​Manchester United having replaced Sir Alex Ferguson with a complete outsider in David Moyes. The latter had no experience of an environment like the one that greeted him at Old Trafford and found himself cutting an isolated figure mere months into his ill-fated reign. Guardiola may not have garnered quite the same level of status on the blue side of Manchester as Ferguson did on the red, but delivering the quadruple would see him written into club folklore. Therefore, the choice of his successor requires careful consideration. If they are to follow a different path to United's in 2013, which should they take? Once again, they may benefit from studying their rivals. After a nightmarish period under previous manager Jose Mourinho, the 20-time English champions turned to a handful of individuals well-versed in the culture of the club. Under the leadership of ex-players Ole Gunnar Solskjaer and Michael Carrick, the side have rediscovered a long-forgotten part of their identity. However, the impact of Mike Phelan's return has gone somewhat under the radar and is arguably the crucial element in their revival. The 56-year-old was Ferguson's protege, learning directly from the man himself about what creates sustained success. His homecoming has been influential in reestablishing Old Trafford as the Theatre of Dreams. The trinity of Phelan, Solskjaer and Carrick could well have spared United the humiliation they endured under Moyes, but who is their equivalent in sky blue? The obvious answer is assistant-manager Mikel Arteta. He was in line to replace Arsene Wenger at ​Arsenal before the Gunners eventually handed the job to Unai Emery. Despite the snub, the club evidently felt Arteta had the credentials to lead an elite Premier League team facing a period of transition. That scenario certainly echoes the situation at the Etihad if Guardiola were to depart.